Apex Limousine and Sedan service invites you to join us and experience all that Alameda CA has to offer – in style. Our beautiful fleet of limousines and sedans are available to provide you with affordable and reliable luxury limousine transportation service for any occasion. 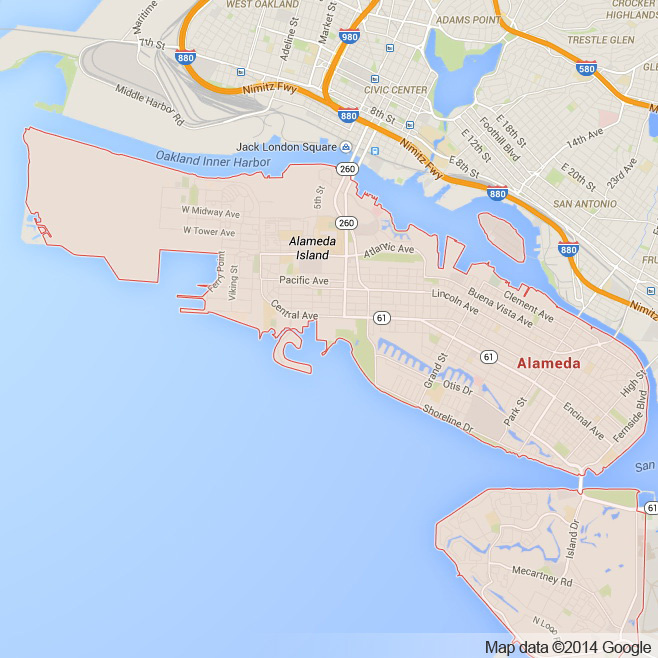 We are proud to offer our comprehensive car services to the Bay Area’s own island,Alameda. Located within view of Oakland’s bustling Jack London Square, Alameda is a serene enclave surrounded entirely by the beautiful waters of the Bay. With a population of no more than 80,000 people Alameda CA feels like the perfect relaxing escape in the middle of the metropolitan Bay Area. The island’s west side is adorned with the incredible Robert W Crown Memorial State beach, perfect for a day of sunbathing and swimming, an afternoon barbeque with friends or a romantic place to watch the sun elegantly set behind the San Francisco skyline. Getting to the beach in one of our limousines or sedans will take you through neighborhoods of beautiful victorian houses unseen anywhere else in the Bay Area. There are more 1906 era victorian homes in Alameda CA than Oakland or San Francisco and this historical charm can be seen on nearly every corner of the island. The historical downtown district embodies this charm with historical buildings and facades that bring you back to another era. The modern world compliments these old beautiful buildings in the downtown district with a plethora of delicious restaurants and exciting bars to choose from. This small town feel with such close proximity to San Francisco and Oakland makes Alameda CA a perfect destination for any occasion. At Apex Limousine Transportation we offer a wide range of comprehensive services to our clients residing in or visiting Alameda CA. For weddings Apex car service offers full limousine transportation services with unparalleled professionalism and reliability to help make the most romantic and special day of your life one to not be forgotten. For proms, Apex’s fleet of limousines, SUVs and sedans are a perfect choice for a whole party traveling together or for a couple seeking something more intimate. Our punctual and professional limousine drivers make us a favorite among the parents of prom attendees. Apex Limousine Transportation is also the leading Northern California provider of Napa Wine Country limousine and sedan tours. We are able to take residents of Alameda CA on day long trips in one of our many luxury limousines to world renowned wineries and restaurants only 45 minutes away. There really is no better way to enjoy the delicious and delectable wines of the Napa Valley than in a luxury limo with friends and family. Apex limousine car service also offers full Airport limousine transportation services to any of the three major airports in the Bay Area. Whether needing a prompt pick up, early drop off or anything in between, Apex car service provides limousine and sedan transportation to and from San Francisco International(SFO), Oakland International(OAK) and San Jose International(SJC) airports. Our airport limousine car services are perfect for businesses or individuals looking for reliable limousine transportation service that is always punctual. Our limousine car services are in high demand so please get in touch with one of our representatives soon! At Apex Limousine Transportation we guarantee the highest quality luxury limousine transportation services every single time. Please call us for car service all inclusive total for Alameda to/from Napa Valley transfer.